Brian Dean, an ISA Certified Arborist at Gail Willey Landscaping explains how landscape designers, architects and contractors need to be proactive regarding the needs of tree roots and the space they require prior to design and planting. 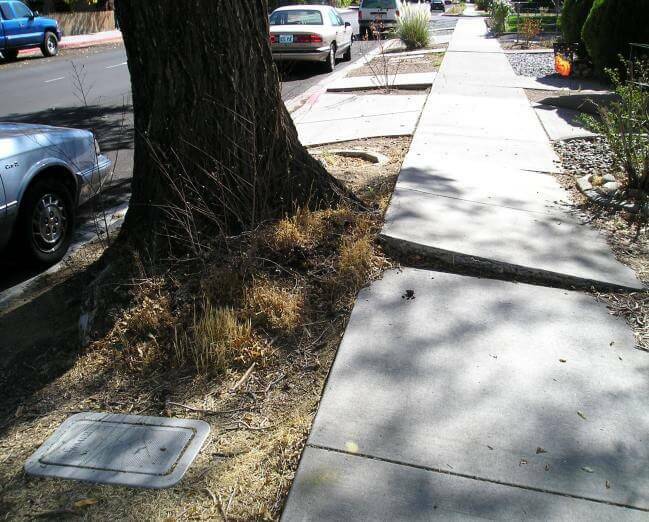 Infrastructure damage caused by tree roots costs millions of dollars per year to repair. Without sufficient soil space for roots to grow, trees will be stunted, decline, die and/or eventually cause damage to hardscaping. Landscape designers, architects and contractors need to be proactive to provide enough soil volume for mature tree growth and development. 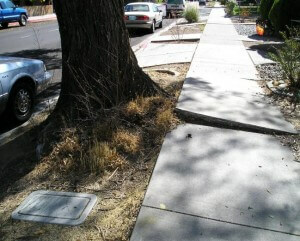 Tree roots have estimated to cost $70.7 million annually in California to repair infrastructure damage (McPherson 2000). This does not include lawsuits involving injury or contractor defect. The average life span of a street tree growing in New York City is estimated at 3 to 15 years (Bassuk and Trowbridge). Street trees are exposed to increased air temperatures (+20 degrees Fahrenheit) and 30% less humidity than a comparable measurement taken in a sheltered park site (Cornell University). This causes street trees to transpire about 1.5 to 2 times as much as a forest tree (Kopinga) therefore requiring more water to survive. Trees planted in narrow strips, small planters or “tree coffins” are an all too familiar problem for arborists and landscapers. When too little space is allocated for root systems to develop naturally, damage to surrounding hardscaping can be expected. The limited root growth also correlates to canopy growth and therefore tree health. It can be a serious problem when trees with shallow/invasive roots are planted in these spaces. Small planting areas with compacted soil limit water and oxygen and therefore inhibit root growth. These small open beds concentrate salt, oil and other contaminates that eventually drain into them creating a toxic environment for roots. A properly selected tree for the location will save money and labor for years to come. Studies show that tree roots grow within the top 18” of soil and are capable of growing two to ten times the area beneath the canopy (Matheny and Clark 1998) and can spread more than twice the width of the canopy (Casey Trees 2008) or one and a half times the height of the tree out radial from the trunk. A trees’ ability to develop a healthy root system is dependent on soil volume. Without sufficient space for root growth trees will lack vigor, exhibit stunted growth, become susceptible to insects, disease, and drought and therefore short lived. In the absence of adequate soil space, roots will exploit available air pockets within the soil. Roots grow where there is adequate water and oxygen. If a tree is confined to a finite space or soil volume it is expected that the canopy spread will only grow proportionately as the roots are allowed. The tree will stop growing, decline and/or eventually die. While the tree is alive the roots will exploit pore space and possibly cause damage to surrounding infrastructure. According to McPherson and Peper “Tree roots are opportunists, utilizing structural faults in infrastructure to capture essential resources”. Kopinga states “Even small diameter roots are able to facilitate pavement damage”. Soil characteristics such as texture, moisture content, structure and percent organic matter also play a role in how and where roots will grow. A good source to find trees with high potential for root damage is the “Urban Forest ecosystems Institute” (UFEI) web site. The “SelecTree” guide located at the UFEI web site rates trees that are high, moderate and low in root damage potential. 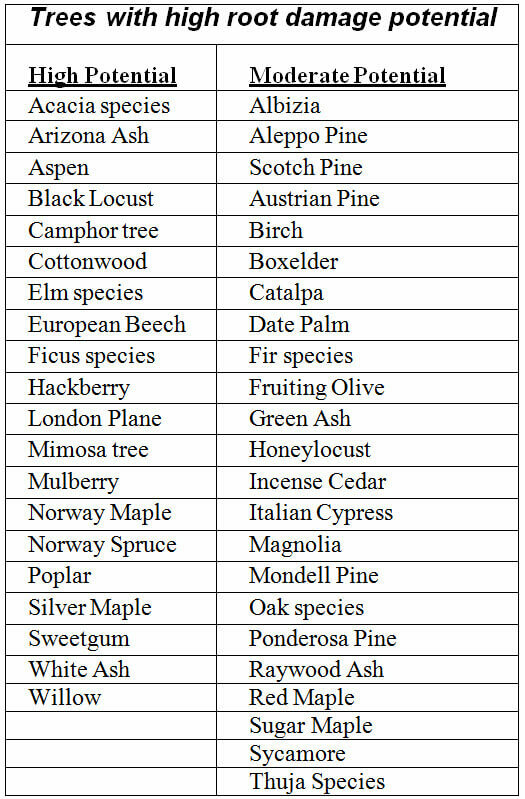 Below are just a few trees listed as high to moderate damage potential that grow in northern and southern Nevada. There are many sources for soil volume recommendations and formulas in the literature that produce varied results. Some formulas use “crown projection” or square foot of canopy area projected on the ground. Others use measurements of canopy volume or the diameter of the trunk to establish soil volume. All formulas have merit however the direct relationship of canopy volume, trunk diameter or crown projection to root volume can be argued. .7854 = 2,827 square feet x 2 cubic feet = 5,654 cubic feet. This formula does not work if the tree has a columnar growth habit such as Lombardy Poplar or Italian Cypress. Another formula by Perry (1982) uses the diameter of the trunk to estimate soil volume. 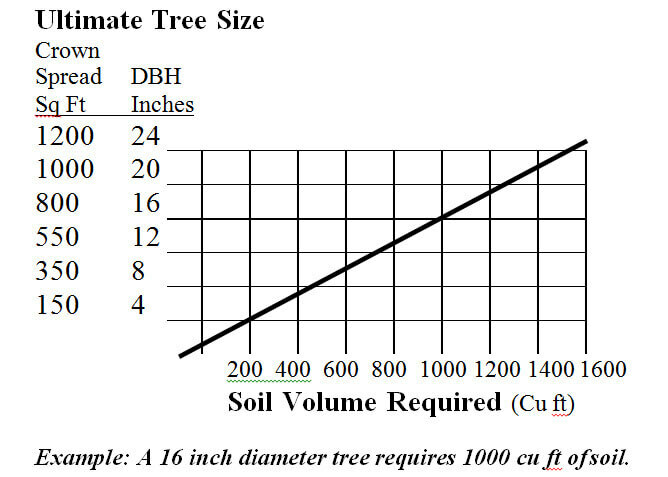 This calculation states that for every 1” of trunk caliper measured at 4.5 feet above grade or diameter at breast height (DBH) needs 27 ft3 of soil volume. James Urban (2008) uses a combination of projected canopy and DBH based on the potential ultimate size of a tree (see table 1). Example: A 16 inch diameter tree requires 1000 cu ft of soil. It should be noted that it is assumed drainage is adequate at the bottom of the soil column. Installation of root barriers has often been used as a solution to prevent infrastructure damage. With over 25 years of research their effectiveness has shown that the roots eventually grow out the bottom of the barriers and return in reduced numbers and size to the surface where they naturally would grow. Harris, Clark and Matheny (2004) note that “root-control devises appear to be least effective where most needed, that is, where poor soil aeration or compaction encourages shallow rooting”. Other observations indicate structural stability may also be compromised especially in trees with dense canopies (Pittenger 2001). However research by Smiley, Key and Greico (2000) growing Green ash showed more force was used to pull over trees in barriers as opposed to no barriers. 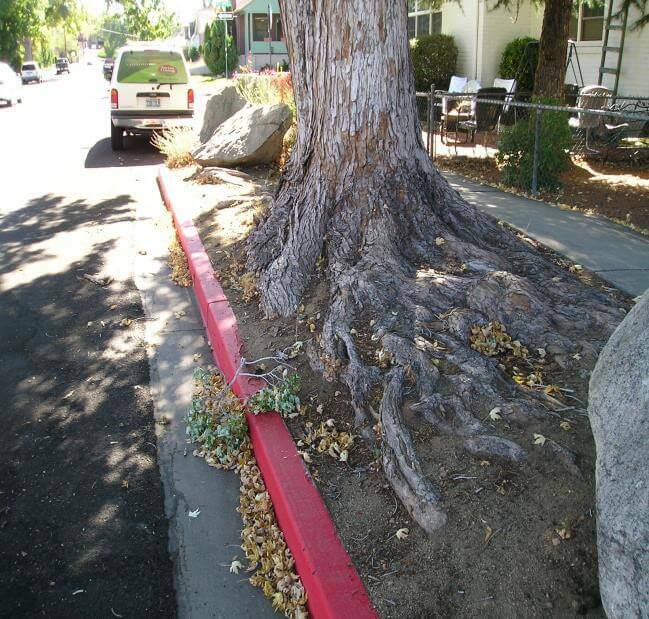 Landscape designers, architects and contractors need to be proactive regarding the needs of tree roots and the space they require prior to design and planting. The consequences will mean increased maintenance costs, create infrastructure damage, poor tree health, reduce the aesthetics of a landscape and possible liability.